Late 90's club trance anthem! Both mixes are perfect but my favourite is, naturally, the Evolution Main Mix: very deeper and full of energy like the other products from this incredible duo. how many more bloody remixes does this track need. Every man and his goldfish has had a crack at it by now. This release came out with a red/grey inner sticker (as depicted in the photo) and blue/grey sticker with the same layout and information. First release on the seminal Bedrock label! Everyone knows (and presumably loves) Heaven Scent but just how good is Life Line? Re-using many of the elements from Heaven Scent, Digweed and Muir cut out the sparkly hands-in-the-air melody and instead created a pulsating prog house stormer. The result- Life Line- is not as anthemic as Heaven Scent but as a no-nonsense dancefloor banger it's far superior. On GU013 Sasha memorably played Life Line and then Heaven Scent back-to-back to close the compilation and it's just about the best thing you can do with Heaven Scent. Is there anything that really needs to be said about this track? 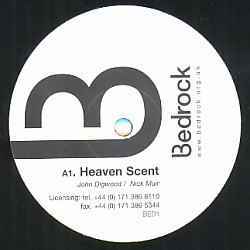 Besides being one of the biggest progressive trance hits of the late nineties, Heaven Scent was also featured in the movie "Groove" as the finishing track in Digweed's set. Never manages to relinquish the attention of the listener, and while epic trance lovers may like this song for its melody, the real great part of the track it its buildup and breakdown, where it uses various sublime synths and a great reverberated drum track to make the track really move you. Along with 'Xpander' by Sasha, 'Heaven Scent' reignited interest in progressive house and inspired countless producers to make wonderful music. Don't be fooled by the progressive tag though, 'Heaven Scent' has in fact as much in common with euro trance as it does with the type of progressive house that would be championed at the Bedrock club nights. Indeed in terms of style, this record saw Digweed in particular start to move to a tougher sound compared to the epic house style he was championing in his Northern Exposure days. This is a quality euphoric anthem that is special to both progressive and trance lovers. Great remix of the all known track "Heaven Scent"
Starts of break-beatisch and builds up nice. the melody is a little remaked and sounds great. he made the best of the original sounds ! then in the break the moledy "morphs" from allturned to original and then comes a constant bass.